My folks celebrated their 44th Wedding Anniversary last weekend, so my sister and I treated them to a $29.99 home cooked meal. Well, that's how much I'd charge in my pretend restaurant, anyway. I couldn't be more proud to celebrate along side them and toast to the true meaning of marriage... love, hard work and growing together as one. So I thought I'd bring some French elegance to the table with Lemon Fish in Parchment with a side of Parmesan Mashed Potatoes. It's very easy to overcook fish when preparing it on the stove, but baking it in the oven in a steamed pouch keeps the fish (in this case, Halibut) moist, tender and packed with endless flavor, depending on what you decide to throw in the pouch with it. 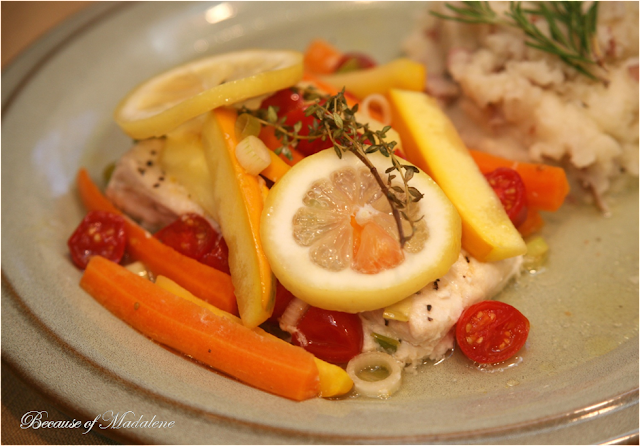 This time, I loaded the fish with orange zucchini, carrots, cherry tomatoes and green onions with a butter lemon wine sauce, topped with fresh lemon and lemon thyme. And in just 15 mins in the oven, you've got a One Pouch Wonder that's fun to cut open right at the dinner table. Preheat the oven to 375 degrees. In a medium bowl, toss together the zucchini, carrots, tomatoes, onions, garlic, salt, pepper and olive oil. 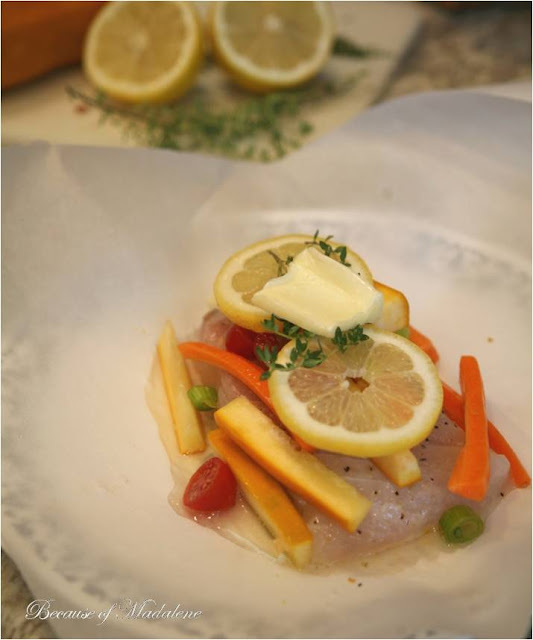 Put each fish fillet in a large rectangle of parchment paper, sprinkle with lemon pepper. Place the veggie mixture on top, dividing evenly. Top the veggies with 2 lemon slices, 2 sprigs of lemon thyme, a pat of butter, 1 tbsp white wine, and splash of fresh lemon juice. Fold over the parchment paper around the edges tightly in 1/4 inch folds (start from one corner to the other) to create a taco shape. Make sure it's sealed well to prevent the steam from escaping. 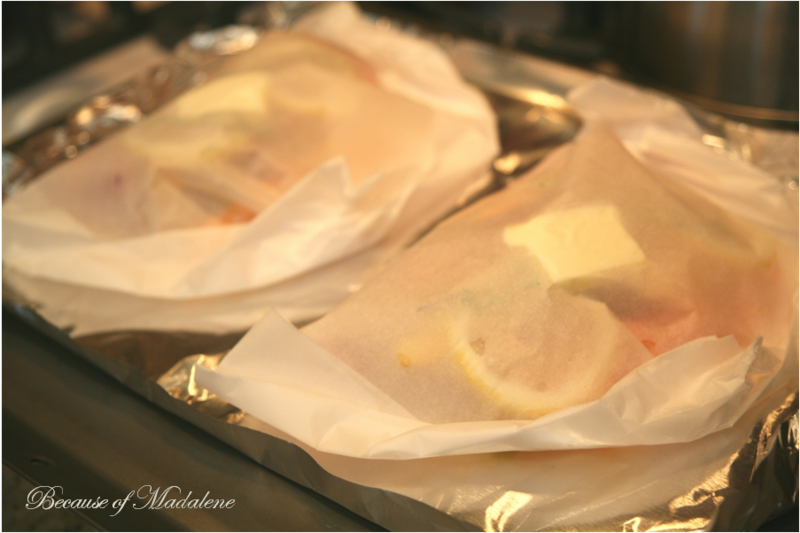 Arrange the pouches on a foil lined baking sheet and bake for about 15 mins (15 mins per 1 in thickness of fish). If it's less than an inch thick, bake for about 12 mins. Take out of the oven and let sit for about 5 - 10 mins. The fish will continue to cook. Place each pouch on individual plates and allow each person to cut open their own. They can either leave the paper or remove from the plate, but leaving the yummy juices. I love fish in this preparation! Definitely a must try! What a beautiful meal for your parents... 44 years...THAT"S AMAZING! Congratulation to them! Hi Sharon and Denise! So happy you found me. 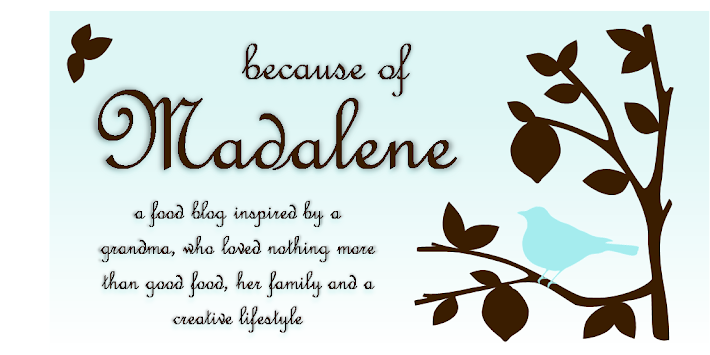 I'll share soon!